Background: This study was conducted to analyse the differences in the efficacy of the treatment of Diabetic Gastroparesis (DGP) in rats by the selection of different acupoints and investigate whether these were a main factor affecting the effect of acupoint compatibility. Materials and Methods: Sixty male SPF SD rats, 12 rats each, were randomly divided into a blank control group, a model group, the Zusanli and Zhongwan group (ZZ), the Zusanli and Neiguan group (ZN), and a Zusanli (ST36) and non-acupoint (ZNA) group after adaptive feeding for 1 w. Except for the blank control group, the remaining 48 rats were used to establish the rat model of DGP by using Streptozotocin-normal feeding. At the end of the 10th w, acupuncture treatment was started. After 4 w of continuous acupuncture, the rats were sacrificed and the hypothalamus was obtained. The content of ghrelin protein in the hypothalamus was detected by immunohistochemistry, and the expressions of ghrelin and GHSR mRNA were detected by real-time PCR. Results: Compared with the blank control group, food intake, the expression of ghrelin in the hypothalamus and expression of GHSR mRNA in the hypothalamus of the model group increased significantly, while the propulsive rate in the small intestine, and the gray scale of the hypothalamic ghrelin decreased significantly (P<0.05). Compared with the model group, the expression of ghrelin and GHSR mRNA in the hypothalamus of the ZZ group, the ZN and the ZNA groups decreased significantly, while the propulsive rate in the small intestine, and the gray scale of hypothalamic ghrelin increased significantly (P<0.05). Compared with the ZZ group, the food intake in the ZN and the ZNA groups increased, while expressions of both ghrelin and GHSR mRNA of the ZN group increased (P<0.05). Further, the local acupoints provided better compatibility than the distal acupoints. Conclusion: The improvement of gastrointestinal motility of DGP by acupuncture is associated with expressions of ghrelin and GHSR in the hypothalamus of rats. Selection of acupoints based on different body sections is the main factor affecting the effect of acupoints compatibility. Acupoints compatibility, Acupoints selection according to the body sections, Diabetic gastroparesis, Acupuncture therapy. Acupoint compatibility is a method to achieve specific therapeutic effect and improve clinical efficacy by selecting more than 2 acupoints with the same effect to play a synergistic role. This process is based on the theory of Chinese medicine, guided by the principle of the selection of specific acupuncture points to create a desired clinical effect. However, two or more acupoints, in addition to synergism, can also produce antagonism and ineffectiveness. Therefore, the compatibility of acupoints is essential for clinical efficacy, and mastering the influencing factors affecting the compatibility of acupoints is an important part in clinical settings. In this study, we hypothesized that the selection of acupoints is an influencing factor affecting acupoints compatibility, and then we aimed to prove it with a Diabetic Gastroparesis (DGP) model in a comparative study in which fixed meridian acupoints compatibility was combined with acupoint selection in different body parts. Diabetic Gastroparesis (DGP), the most common chronic complications of diabetes, is a group of clinical syndromes characterized by low gastric motility in diabetic patients causing loss of appetite, early satiety, nausea, and vomiting . To date, the pathogenesis of DGP has not yet been fully understood, but may be associated with abnormal secretion of gastrointestinal hormones (intestinal peptide or brain-gut peptide) [2,3], reduction in the number of pacemaker cells , autonomic neuropathy , and hyperglycemia . However, at present, ghrelin and the Growth Hormone Secretagogue Receptor (GHSR) are becoming increasingly important in the study of the pathogenesis of DGP. The main role of ghrelin is to stimulate growth hormone secretion and regulate energy balance. Weight loss caused by a low calorie diet, exercise, anorexia nervosa, organ failures (heart, lung, kidney, and liver), and cancer cachexia can lead to an increase in ghrelin levels [7,8], appearing as a short-term signal to regulate food intake. Ghrelin is also a long-term signal of nutritional status. Besides, it can also improve gastric acid secretion and gastrointestinal motility, as well as play a role of protecting the mucosa of the digestive system . In addition, ghrelin has a certain role in gastrointestinal motility, affecting digestive enzyme secretion, and intestinal cell proliferation . Therefore, this experiment mainly investigated the impact of the selection of acupoints in various sections of the body on ghrelin in the serum of DGP rats, fundic tissue, and the hypothalamic tissue. Ethical approval was given by the medical ethics committee of Sixth People's Hospital of Qingdao with the following reference number: 2016006.Sixty SPF adult male Sprague Dawley (SD) rats (200 to 220 g) were provided by Hunan Slack Jingda Experimental Animal Co., Ltd. (certificate number SYXK2013 (Xiang)-0005). All the rats were tested by blood glucose meter, and only rats with normal blood glucose were included in this study. The rats were fed in the SPF experimental animal room in the Experimental Animal Center of Hunan University of Traditional Chinese Medicine, with the feeding temperature of 22°C to 25°C, at humidity of 40% to 60%, and natural light. After 1 w of adaptive feeding, according to the random number table, the rats were randomly divided into a blank control group, a model group, the Zusanli and Zhongwan (ZZ) group, the Zusanli and Neiguan (ZN) group, as well as the Zusanli and Non-meridian Acupoint group (ZNA), with 12 rats in each group. The disposal and operation of the animals during the experiment were in accordance with the relevant provisions of the Guidance Opinion on the Treatment of Experimental Animals issued by the Ministry of Science and Technology, China. Streptozotocin (STZ) was provided by Sigma, with the batch number of 015H 1492. The Trizol kit was provided by Invitrogen. Blood glucose meter and blood glucose test strips (Regaine) were from Johnson &Johnson. Acupuncture needles were sterile acupuncture needles from Huatuo produced in Suzhou, and their size was 0.30 mm × 25 mm. Violet spectrophotometer was UV-1800 from Shimadzu (Japan). Electrophoresis instrument was DDY-5 from Beijing LiuYi instrument. Gel imaging analysis system was purchased from US Bio-Rad. Centrifuge was from Thermo of US (Legend Micro 17 R). Fluorescence quantitative PCR apparatus was purchased from Applied Biosystems of America (7900 HT Fast). Rabbit anti-mouse ghrelin antibody (1:2500) and rabbit anti-human GHS-R antibody (1:100) were purchased from Phoenix Biotechnology Co., Ltd. (United States). Rats in the model group, the ZZ group, the ZN group, as well as the ZNA group were left to fast for 12 h, and 2% STZ was prepared by 0.1 mmol/L citric acid-sodium citrate buffer (Ph 4.5, 4°C) before use. Through a disposable injection STZ was injected in the left lower abdominal cavity at 60 mmol/kg. Random blood glucose was detected after 72 h, and rats with ≤ 16.7 mmol/L of blood glucose were injected again in the same way. Rats in the blank control group were injected via a disposable injection with equal volume of 0.1 mmol/L citric acid-sodium citrate buffer, and they were time fed with common feed at 10:00 each morning. At 13 w of the experiment, rats with random blood glucose ≤ 16.7 mmol/L were excluded. Success criterion of the DGP model  was including rats with a blood glucose ≥ 16.7 mmol/L. The general condition and the stool of rats were observed in all groups. The gastric emptying rate and the propulsive rate in the small intestine of the rats were also observed in all groups and the differences noted. Acupoint localization: Acupoint localization in the rats was performed according to the Atlas of Chinese Acupuncture Points of Animal  in Experimental Acupuncture Science edited by Li Zhongren and the anthropomorphic method. The Zhongwan acupoint locates on the linea alba, about 20 mm above the umbilicus. Zusanli is located below the lower edge of the knee, at 5 mm to the lower edge of the fibula, on both the left and right of the legs. Neiguan locates inside the forelimb, which is in the suture between the ulnar and the radial that is about 3 mm to the wrist joints in rats. The nonmeridian acupoint locates inside the elbow, on the midpoint between the Zhoujian and the axillary region. The blank control group and the model group: Rats were bound to mouse boards for 30 min at each time, once every day, which was consecutively performed for 4 w. For the ZZ group, the ZN group, as well as the ZNA acupoint group: corresponding acupoints on both sides were taken with an acupuncture depth of 0.3-0.5 cm. Conventional needleinsertion method was used and the needle was retained for 30 min. Hand-manipulation of the needle was performed every 10 min combined with lifting and thrusting and twirling of the needle. Reinforcing-reducing method was also conducted, and the amplitude of lifting and thrusting of the needle was between 0.3-0.5 cm, with a frequency of 60-90 times/min. The amplitude and frequency of lifting and thrusting of the needle used equal means. At the 30th min, the needle was withdrawn after completing hand-manipulation of the needle. The above steps were continued for 4 w.
Method for the determination of food intake: 300 g of normal feed were given to the rats in each cage at 10:00 each morning. Weight measured before feeding on the next day was the weight of the remaining feed. 300 g minus the weight of the remaining feed was the daily intake of rats per cage. Methods for the determination of blood glucose: Blood samples were taken from the tail vein every week, and blood glucose was measured with a blood glucose meter and blood glucose test strips. Propulsive rate in the small intestine=Distance from the front of the ink to the pyloric sphincter (cm)/distance from the pyloric sphincter to the distal end of the small intestine (cm) × 100%. The hypothalamus was cut into 4 mm small pieces, which was fixed in paraformaldehyde buffer for 8 h, and washed with running water. Then, gradient dehydration was performed with 20% to 30% sucrose solution. After quick-freezing with liquid nitrogen, these pieces were embedded in a tissue embedding agent. These pieces were sliced continuously using a constant cold slicer, with the thickness of the slice of 10 μm. Next, they were attached to the slides processed by polylysine. Immunohistochemical staining of ghrelin and GHS-R were performed by SABC. The primary antibody of ghrelin was rabbit anti-mouse antibody (1:2500), and primary antibody of GHS-R was rabbit anti-human antibody (1:100). Sequentially, DAB coloring was performed. The expressions of ghrelin and GHS-R were observed under high-power microscope after sealing with neutral gum. Under high-power microscope (400X), 10 fields were taken from each slice, and the mean value of the slice was used as the average gray scale expressing indexes of the slice. Expressions of ghrelin mRNA and GHSR mRNA in hypothalamus were detected as follows: Thalamus tissues were extracted and stored in a refrigerator of -80°C for measurement. Extraction of mRNA: Total RNA was extracted from the rat gastric fundus tissue according to instructions of trizol extraction kit and analysed by 1.5% agarose gel electrophoresis. OD260 and 0D280 of the extracted RNA were measured, and their concentrations and purities were calculated. With all the concentrations of 1.5 μg/μL and the OD 260/280 ratio between 1.8 and 2.1 suggesting that the quality of the extracted RNA was reliable. Synthesis of cDNA: The operation was conducted according to SuperScriptIII reverse transcription kit to obtain reverse transcription product (cDNA). PCR amplification: β-actin was used as the internal reference, and the primers are shown in Table 1. Amplification program was as follows: pre-denaturation was conducted at 95°C for 10 min, followed by denaturation at 95°C for 10 s. After that, 60°C annealing/extension was performed for 60 s (fluorescence was collected). The reaction was conducted with 40 cycles. Table 1: Primer sequence and amplification length. After the completion of amplification reaction, dissolution curve of PCR products was established by heating gradually from 60°C to 99°C according to the steps of 95°C for 10 s, 60°C for 60 s, and 95°C for 15 s. The results were analysed by the relative quantitative 2-ΔΔCt method. ΔCt was obtained by Ct value of the target genes in each sample -Ct value of β-actin in each sample, and ΔΔCt was obtained using ΔCt-mean value of Ct values in the blank control group. Statistical analysis was performed for all the data using SPSS 17.0 statistical software. Data met normal distribution and were represented by mean ± Standard Deviation (mean ± SD). If data were tested to meet the normality and variance homogeneity, then comparison among multiple groups was conducted by single-factor analysis of variance, and multiple comparisons were performed using LSD method. If data did not meet the variance homogeneity, then Tamhane T2 test was used. Skewed distribution data were represented by Median (M) and interquartile range (QR), and comparison between groups was completed by rank sum test. P<0.05 was considered to be statistically significant. During the experiment, the mental state of the rats was good in the blank group; the behavior and activities were normal, and the reactions were sensitive. Moreover, the rats ate well, their furs were milky white and shiny, without significant change in stool and urine. Polydipsia, polyphagia, and polyuria occurred in the rats of the model group, the ZZ group, the ZN group, as well as the ZNA group at 3 d after injecting the STZ solution. From the 3rd w, the DGP rats showed signs of poor mental state, slow behavioral activity, slow growth of body weight or even reduced body weight, and at the 6th w, the rats showed signs of dull furs as well as changes in the characteristics and shape of the stool that was smelly. In addition, the rats displayed an abnormal abdominal bulge. Mortality status: One rat died in the blank control group, three in the model group, two in the ZZ group, two in the ZN group, and three rats in the ZNA group, respectively. Table 2 demonstrates that compared with the blank control group, the food intake of the model group increased significantly with statistical significance (P<0.05). Compared with the model group, the food intake of the ZNA group increased significantly with statistical significance (P<0.05), while the differences between the ZZ group as well as the ZN group were not statistically significant (P>0.05). Compared with the ZZ group, the food intake of the ZN group as well as the ZNA group increased significantly with statistical significance (P<0.05). These results indicated that compatibility of local acupoints can reduce food intake of DGP rats, while compatibility of distal acupoints did not have obvious changes in food intake. Moreover, compatibility with non-meridian point acupoints increased the food intake of rats. Table 2: Comparison of food intake of DGP rats by acupoints selection according to the different body sections (mean ± SD). Note: Compared with the blank control group *P<0.05. Compared with the model group, ΔP<0.05. Compared with the Zusanli and Zhongwan group, P<0.05. The results indicated in Table 3 reveal that compared with the blank control group, the propulsive rate in the small intestines of the model group decreased significantly with statistical significance (P<0.05), suggesting a successful modeling. Compared with the model group, the propulsive rate in the small intestines in the ZZ group, the ZN group, as well as the ZNA group increased significantly with statistical significance (P<0.05). There was no statistical significance among the three treatment groups (P>0.05). These results demonstrated that all the three treatment groups could improve the propulsive rate in the small intestines of DGP rats, and the compatibility of local acupoints was better than that of distant acupoints, while the compatibility of distant acupoints was better than non-meridian acupoints. Table 3: Comparison of the propulsive rate in the small intestines in DGP rats by acupoints selection according to the different body sections (mean ± SD). Note: Compared with the blank control group, *P<0.05. Compared with the model group, ΔP<0.05. The comparison is illustrated in Figure 1. The results showed that compared with the blank control group, gray scales expressed by ghrelin in the hypothalamus of the model group decreased significantly with statistical significance (P<0.05). Compared with the model group, ghrelin gray scales of the ZZ group, the ZN group, as well as the ZNA group increased significantly with statistical significance (P<0.05), indicating that all the three compatibility groups can decrease the expression of positive cells in hypothalamic ghrelin (Table 4). 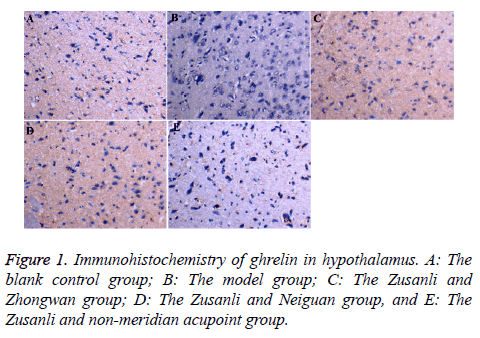 Figure 1: Immunohistochemistry of ghrelin in hypothalamus. A: The blank control group; B: The model group; C: The Zusanli and Zhongwan group; D: The Zusanli and Neiguan group, and E: The Zusanli and non-meridian acupoint group. Table 4: Comparison of ghrelin gray scale of hypothalamus in DGP rats with acupuncture by acupoint selection based on body sections (mean ± SD). Note: compared with the blank control group, *P<0.05. Compared with the model group, P<0.05. The results (Table 5) showed that expressions of ghrelin and GHSR mRNA in the hypothalamus of the model group were significantly higher than those in the blank control group with statistical significance (P<0.05). Compared with the model group, expressions of Ghrelin and GHSR mRNA in hypothalamus of the ZZ group, the ZN group, as well as the ZNA group were all decreased with statistical significance (P<0.05). Compared with the ZZ group, expressions of Ghrelin and GHSR mRNA in the hypothalamus of the ZN group significantly increased with statistical significance (P<0.05). Compared with the ZN group, expressions of Ghrelin and GHSR mRNA in hypothalamus of the ZNA group decreased with statistical significance (P<0.05). The results suggested that the compatibility of local acupoints and the compatibility of non-meridian acupoints were better than the compatibility of distant acupoints. Table 5: Comparison of mRNA expressions of ghrelin and GHSR in hypothalamus of DGP rats acupunctured by acupoints selection according to the different sections of the body (mean ± SD). Note: compared with the blank control group, *P<0.05. Compared with the model group, ΔP<0.05. Compared with the Zusanli and Zhongwan group, P<0.05. Compared with the Zusanli and Neiguan group, #P<0.05. It has been shown that the influencing factors of the effects of acupoints compatibility are mainly in the aspects of the compatibility method, compatibility effect, stimulation means and degrees, time factor, as well as body states . However, Wang Fuchun et al. believed that acupuncture prescription included acupoints composition and a therapeutic method . Therefore, different stimulation methods and time factors of the therapeutic methods were external factors. Body state is to emphasize the individual differences, which is the content of dialectical governance. Hence, acupoint selection in acupoints compatibility is usually used as a main factor affecting its effects . There are many ways to detect acupoints compatibility, including Yuan-primary point and luoconnecting point combination, back-shu points and front-mu point’s combination, eight convergent points combination, hesea points and front-mu points combination, distal-proximal points combination, point ion in accordance with differentiation of syndrome, and midnight-noon ebb-flow points combination. Analysis of various ways of compatibility has shown that acupoints compatibility is mainly based by two ways: compatibility based on body parts, and compatibility along meridians . Therefore, acupoint selection is a main influence factor that affects the effects of acupoints compatibility, which includes acupoints selection according to the sections and acupoint selection based on meridians. This subject was based on the hypothesis that acupoints selection according to the different sections of the body is an influencing factor affecting the effect of acupoints compatibility, and with DGP as a disease model, we performed a comparative analysis between the treatment group with the compatibility of local acupoint selection based on acupoint selection with the meridian and the control groups with the compatibility of the distal acupoint selection as well as the non-meridian point selection. Symptoms of nausea, vomiting, and abdominal distension caused by DGP belongs to the areas of vomiting and nausea in Chinese Medicine. Chinese Medicine believes that this disease is caused by the failure of the spleen and the stomach’s ascending and descending, impaired harmony and down bearing of the stomach, and being unable to distinguish between the clear and the muddy, which is usually attributed to disease of the spleen and stomach. Through the analysis of clinical literatures in which DGP is treated by acupuncture in the past five years, it has been found that the four frequently used meridians are Stomach Meridian of Foot-Yangming (the total frequency of the acupoints is 29.45%), Ren channel, bladder meridian of foot-taiyang, and spleen meridian of Foottaiying. However, the most frequently used acupoint is the Zusanli acupoints of Yangming Stomach meridian of Foot (accounting for 15.53% of the total frequency). Thereafter, Zusanli is the acupoint selected by meridian. Zusanli is Yangming Stomach Meridian of Foot, and also the He-sea point of the Stomach channel as well as the lower He-sea point of the Stomach, which plays roles in regulating spleen and stomach, as well as invigorating spleen-stomach and replenishing qi. It is usually used to treat gastrointestinal diseases clinically. Modern studies [16,17] have found that Zusanli plays roles in improving gastric receptive diastolic dysfunction, and increasing gastric migrating motor complex through reducing duration of phase I as well as increasing the duration of phases II and III to enhance gastric contraction. Besides, through 5-HT pathway, serotonin, and vagus nerves, it can take part in the acceleration of gastric emptying. Acupoints selection according to the different sections can be divided into local and distal according to the body parts. This study group divided the commonly used 41 acupoints (except Zusanli) obtained by literature analysis that were used in the treatment of DGP into two groups. In addition, the acupoints with the highest frequencies in the two groups were selected, including Zhongwan (local) and Neiguan (distal). Zhongwan, the front-mu point of the Stomach, belongs to Ren channel, which is a place where Qi of Yangming Stomach Meridian of Foot gathers. Zhongwan functions in regulating stomach and spleen that is interior-exteriorly related to the stomach. Moreover, it is used to treat gastrointestinal diseases, epilepsy and insomnia, as well as phlegm cough. Modern studies have found that stimulation of the Zhongwan can enhance gastric motility in rats . Neiguan belongs to pericardium meridian, which makes luo-connecting point of the meridian and the eight confluent acupoints connecting the eight extra channels connects with the Yinwei meridian. In clinical settings, Zhongwan is mainly used in cardiac pain, palpitation, chest tightness, stomach ache, vomiting, hiccup, insomnia and insane, upper limb pain, hemiplegia, numbness in fingers, and vertigo. Modern studies have found in patients with gastroparesis, by using scintigraphy to record and observe, that electroacupuncture of Neiguan can accelerate the solid gastric emptying, as well as that the regulatory role by acupuncture of "Neiguan" focuses on promoting gastric motility . Therefore, the present study performed a comparative study with healthy SPF rats as the blank control group, model rats with DGP as the model group, the ZZ as the treatment group, the ZN group as well as the ZNA group as the control groups. Then, comparison of the excellence among compatibility of local acupoint selection, compatibility of distal acupoint selection, and compatibility of non-meridian points were performed to guide the clinical work. Food intake increases in the early stage of diabetes, while it decreases in the advanced stage due to the occurrence of gastroparesis. Jing et al. established a diabetic model using alloxan, and compared it with the blank control group after one month, finding that food intake of the model group increased. After that, they observed for 42 d and found that food intake of rats in the model group gradually decreased, but were still higher than that in the blank control group. Results of our study suggested that the food intake of the model group increased compared with the blank group, which is consistent with the literature. Comparison of the three treatment groups with the model group, we found that food intake in the ZZ group reduced, while food intake increased in the ZN as well as the ZNA groups, which may be because Zhongwan can inhibit gastric motility, while Neiguan and Zusanli can promote gastric motility. Study of Sun et al. demonstrated that under normal physiological state as well as under pathological states such as enhanced gastric motility and inhibited gastric motility, acupuncture of both Zusanli and Neiguan can promote gastric motility, but acupuncture of both Zhongwan and Qihai can inhibit gastric motility. Local acupoints such as Zhongwan are points in the same (near) segment of the stomach, which can inhibit gastric motility by enhancing sympathetic nerve activity, and acupoints in different segments of the stomach (distal) such as Zusanli and Neiguan can promote gastric motility by exciting the vagus nerve. Ghrelin is a novel endogenous ligand of Growth Hormone Secretagogue Receptor (GHSR), which has been shown by studies that it has biological effects such as promoting appetite, promoting gastrointestinal peristalsis, reducing blood pressure, promoting cell proliferation, inhibiting the release of inflammatory factors, promoting the proliferation and differentiation of cartilage cells, and promoting skeletal growth. Study of Ruter et al. found that intraperitoneal injection of ghrelin led to increased food intake in rats, and also increased expression of hypothalamic arcuate nucleus as well as the paraventricular nucleus of c-fos . Intracerebroventricular and paraventricular nucleus infusion of ghrelin can promote food intake in rats, increase food-related nuclei, such as hypothalamic paraventricular nucleus, dorsomedial nucleus, arcuate nucleus, nucleus solitary tract nucleus, and the final area of c-fos expression [23,24]. Through the interaction with appetite-regulating neural networks, ghrelin can be combined with hypothalamic GHSR to promote food intake, and combined with GHSR in gastrointestinal sites to promote complex exercise during the gastrointestinal digestive interval . Therefore, this experiment verified the differences in efficacy of diabetic gastroparesis treated by acupoints selection according to the sections through testing expressions of ghrelin and GHSR in the hypothalamus. The impact of acupoints selection according to the different sections of the body on ghrelin and GHSR in the hypothalamus of DGP rats suggested that acupuncture can regulate food intake and expressions of ghrelin and GHSR mRNA in the hypothalamus, while compatibility of local acupoints (Zhongwan) was better than compatibility of distal acupoints (Neiguan). Moreover, in terms of regulating propulsive rate in the small intestine and expression of hypothalamic Ghrelin positive cells, there was a tendency that compatibility of local acupoints (Zhongwan) was superior to the compatibility of distal acupoints (Neiguan), suggesting that acupoints selection based on body parts was one of the main influencing factors that affected the effects of the compatibility of acupoints. In the compatibility of acupoints, the reason that local acupoint selection is superior to distal acupoint selection may be related to the specificity of local acupoints. Local acupoint selection refers to the selection of acupoints in the affected organs, facial features, and body parts, which aims to regulate the Yin and Yang of the Qi and blood in the nearby affected parts. Moreover, it is a specific manifestation of “the main treatment can get to the location of acupoints”. Zhongwan is a front-mu point of the stomach, which is an acupoint that Qi of the stomach is infused into the chest and abdomen. Zhongwan plays a role in directly regulating the function of the stomach and the spleen. The A-B Classic of Acupuncture and Moxibustion by Huang Fumi in the Jin dynasty recorded that Zhongwan can be used to treat patients with gastric distention. Zhongwan and Zusanli are composed of commonly used compatibility of acupoints in clinical settings, which is He-sea points and front-mu points association. Dong et al. indicated that He-sea points and front-mu points association was superior to single point in regulating the expression of Gonadotropin-Releasing Hormone (GnRH) and Substance P (SP) mRNA in hypothalamus of stress-induced gastric ulcer rats. The above studies obtained conclusions by the comparative study with spleen and stomach diseases as the carrier, Zhongwan as the study subject, and Neiguan and nonmeridian point as the control. The improvement of gastrointestinal motility of DGP by acupuncture is associated with expressions of ghrelin and GHSR in the hypothalamus of rats. Selection of acupoints based on different body sections is the main factor affecting the effect of acupoints compatibility. Different diseases have the characteristics of different symptoms, so whether acupoints selection according to the different sections has the same advantages in the treatment of other organ diseases needs to be further confirmed. This work was supported by the National Basic Research Program of China (No: 2014CB543102 and No. 2015CB554502), the National Natural Science Foundation of China (No. 81673886 and No. 81603705). Ma H, Gao X, Lin HD, Hu Y, Li XM, Gao J, Zhao NQ. Glycated haemoglobin in diagnosis of diabetes mellitus and pre-diabetes among middle-aged and elderly population: Shanghai Changfeng study. Biomed Environ Sci 2013; 26: 155-162. Lund A, Knop FK, Vilsbill T. Glucagon-like peptide-1 receptor agonists for the treatment of type 2 diabetes: differences and similarities. Eur J Intern Med 2014; 25: 407-414. Tong J, Dalessio D. Give the receptor a brake: slowing gastric emptying by GLP-1. Diabetes 2014; 63: 407-409. Grover M, Bernard CE, Pasricha PJ, Lurken MS, Faussone-Pellegrini MS, Smyrk TC, Parkman HP, Abell TL, Snape WJ, Hasler WL, McCallum RW, Nguyen L, Koch KL, Calles J, Lee L, Tonascia J, ünalp-Arida A, Hamilton FA, Farrugia G, NIDDK Gastroparesis Clinical Research Consortium (GpCRC). Clinical-histological associations in gastroparesis: results from the Gastroparesis Clinical Research Consortium. Neurogastroenterol Motil 2012; 24: 531-539. Tang M, Donaghue KC, Cho YH, Craig ME. Autonomic neuropathy in young people with type 1 diabetes: a systematic review. Pediatr Diabetes 2013; 14: 239-248. Phillips LK, Deane AM, Jones KL, Rayner CK, Horowitz M. Gastric emptying and glycaemia in health and diabetes mellitus. Nat Rev Endocrinol 2015; 11: 112-128. Espelund U, Hansen TK, Hijlund K, Beck-Nielsen H, Clausen JT, Hansen BS, Orskov H, Jorgensen JO, Frystyk J. Fasting unmasks a strong inverse association between ghrelin and cortisol in serum: studies in obese and normal-weight subjects. J Clin Endocrinol Metab 2005; 90: 741-746. Schubert ML. Gastric exocrine and endocrine secretion. Curr Opin Gastroenterol 2009; 25: 529-536. Poitras P, Tomasetto C. The potential of ghrelin as a prokinetic. Regul Pept 2009; 155: 24-27. Mathus-Vliegen EM, Eichenberger RI. Fasting and meal-suppressed ghrelin levels before and after intragastric balloons and balloon-induced weight loss. Obes Surg 2014; 24: 85-94. Lin G, Zhang J, Li L, Zou Z, Chen C, Xue L, Zhao L. Effect of electroacupuncture on gastric interstitial cells of Cajal in a rat model of diabetic gastroparesis. Exp Ther Med 2016; 11: 2489-2494. Zhongren L. Experimental acupuncture. Beijing: China Press of Traditional Chinese Medicine 2007. Algarotti FC. A study of the nature, characters and causes of the contradictions among the people in the new historical stage. Zhongguo Zhen Jiu Chinese Acup Moxib 2015; 35: 719-722. Zhang GX, Liu H, Wang FC. Acupoint combination and acupuncture-moxibustion prescription. Zhongguo Zhen Jiu 2014; 34: 987-990. Shi Y, Shan C, Wang F. Acupoint selection: a key factor to influence the compatibility of acupoint. Zhongguo Zhen Jiu 2015; 35: 1025-1027. Yin J, Chen J, Chen JD. Ameliorating effects and mechanisms of electroacupuncture on gastric dysrhythmia, delayed emptying, and impaired accommodation in diabetic rats. Am J Physiol Gastrointest Liver Physiol 2010; 298: 563-570. Sugai GC, Freire Ade O, Tabosa A, Yamamura Y, Tufik S, Mello LE. Serotonin involvement in the electroacupuncture- and moxibustion-induced gastric emptying in rats. Physiol Behav 2004; 82: 855-861. Yu J, Peng H, Lin Y, Yi S. Effect of moxibustion treatment on cell apoptosis and expressions of heat shock protein and second mitochondrial activator of caspase in acute gastric mucosal lesion of rats. J Tradit Chin Med 2013; 33: 258-261. Zhang XF, Yin GZ, Liu QG. Does braun enteroenterostomy reduce delayed gastric emptying after pancreaticoduodenectomy? Medicine 2014; 93: 48. Jing Q, Wu GT, Du LD, Liu WZ, Li YD, Ren Y. Therapeutic effects of ethanol extracts of Angelica sinensis and Astragalus mongholicus in diabetic gastroparesis rats. Zhong Yao Cai 2014; 37: 1415-1420. Sun GJ, Wang SJ, Du YJ, Hu HP, Wu XP, Kong LH. Study on dual-directional regulation induced by acupuncture at different acupoints in the rat with motility abnormality of the stomach. Zhongguo Zhen Jiu 2007; 27: 839-842. Ruter J, Kobelt P, Tebbe JJ, Avsar Y, Veh R, Wang L, Klapp BF, Wiedenmann B, Taché Y, Monnikes H. Intraperitoneal injection of ghrelin induces Fos expression in the paraventricular nucleus of the hypothalamus in rats. Brain Res 2003; 991: 26-33. Sakurazawa N, Mano-Otagiri A, Nemoto T, Shibasaki T. Effects of intracerebroventricular ghrelin on food intake and Fos expression in the arcuate nucleus of the hypothalamus in female rats vary with estrous cycle phase. Neurosci Lett 2013; 541: 204-208. Cone JJ, McCutcheon JE, Roitman MF. Ghrelin acts as an interface between physiological state and phasic dopamine signaling. J Neurosci 2014; 34: 4905-4913. Udit S, Gautron L. Molecular anatomy of the gut-brain axis revealed with transgenic technologies: implications in metabolic research. Front Neurosci 2013; 7: 134. Dong LL, Liu AG, Wang JY, Ma CB, Zhu TT, Yan XK. Effect of acupuncture of Ho (ST 36)-plus Mu (CV 12)-acupoints on hypothalamic gonadotropin-releasing hormone mRNA and SP mRNA expression in stress-induced gastric ulcer rats. Zhen Ci Yan Jiu 2013; 38: 291-296.